Would you build your house on sticks? Homes built on Pearson Pilings are built to last. Waterfront homes or stilt houses built on Pearson Pilings are built to last. Using Pearson fiberglass composite pilings for house foundations protects your home from damage. 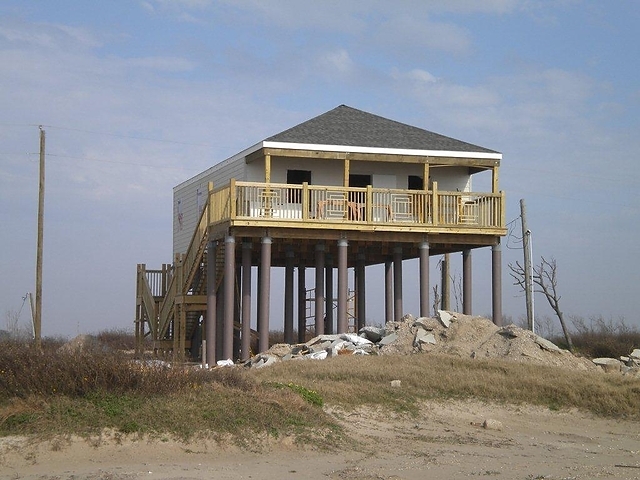 Don’t risk building your new waterfront home or stilt house on foundation pilings that begin to deteriorate the moment they are driven. Pearson Fiberglass Composite Pilings will never rot, rust or crumble. Strong enough to last for generations, they may never have to be replaced. Stronger than wood, steel or concrete, they better withstand the forces of nature. As friction pilings, they provide greater resistance to the soil, whether sand or soft mud. As a result, your home’s foundation is far less likely to shift during severe, high storm surges. Pearson Pilings are not only the strongest, longest lasting pilings, they’re also environmentally friendly. While impervious to rot, rust and wood-boring insects, they contain no harmful coatings or preservatives, that can leach into the water or soil. Today, more architects and structural engineers are discovering the huge benefits of building above-grade foundations with Pearson Fiberglass pilings. Considering the significant cost of a new waterfront home, beach house or stilt home, why build it on foundation pilings that will eventually have to be replaced or are susceptible to shifting or damage under extreme conditions? Ask your builder or architect to specify the best: Pearson Fiberglass Composite Pilings. It’s the smartest investment you can make in your new home. We were building our new home for the future and we wanted it to be built on pilings that would last a lifetime. See how the cost of fiberglass composite pilings compares to wood and Southern Pine.